I would like to say thank you again for everyone who has supported me so far in this year’s Baillie Birdathon. I am at $935 now, well past my original goal of $500 — I picked my goal amount because it seemed better to choose a modest amount. I had no idea people would be so supportive and generous, especially for a second year. I would like to thank the following recent donors: my aunt Kerri in Toronto, Angela, and Leslie. And another special thank you to Curtis and Michelle for their extra encouragement. 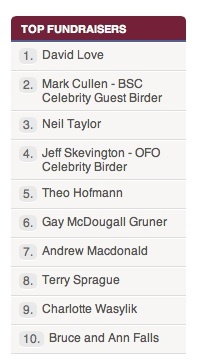 Also, I saw this yesterday at the Baillie Birdathon website and am amazed to be in the top 10 — I know it won’t last, because I am just one 15-year-old in rural western Canada, but it shows me how much support the Birdathon and its goals have. Thank you all, so very much! 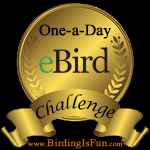 This entry was posted in Bird Conservation, Great Canadian Birdathon, Spring and tagged Great Canadian Birdathon, Thank You. Bookmark the permalink. Way to go Charlotte… you’re over $1000… let’s see how many birds you see! Thank you so very, very much Michelle and Curtis!